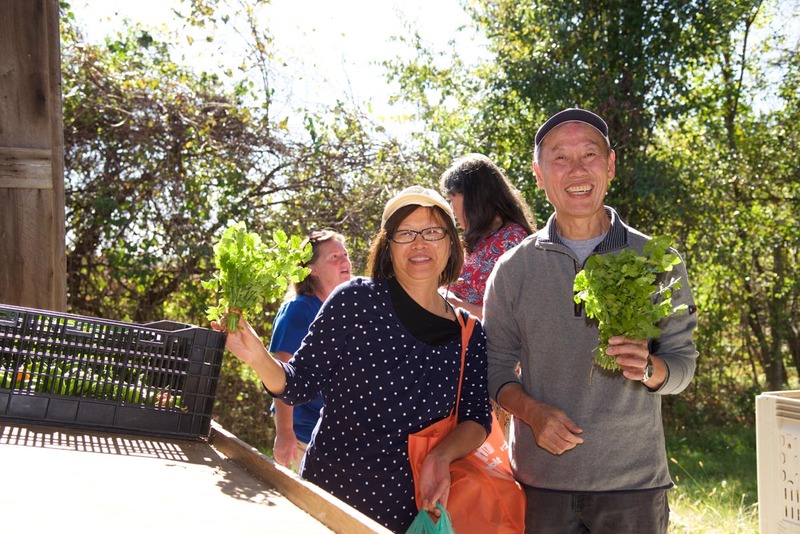 Community Supported Agriculture (CSA) is a mutually beneficial relationship between our local farms and the community of people who receive the food. Our members purchase a “share” of the harvest before the growing season starts. In return, Members receive a weekly supply of fresh, seasonal vegetables picked at their peak of ripeness and flavor. The members agree to share in the inherent benefits and risks of the agricultural season. This arrangement guarantees the farmer financial support and enables many smaller sustainable farms to stay in business. In a growing number of instances, this provides a way for people to consider a career in farming. Who is CSA good for and who is it not? CSA is intended for individuals and families that eat at home, who enjoy cooking/trying new things, and have an interest in quality eating. If you eat out more than you eat in, this probably isn’t for you. If you passionately object to eating several varieties of common vegetables, this is not for you. How much commitment is a CSA? Is the CSA a good value when compared to shopping at the store or farmer's market? Yes, we definitely think so! Cost analysis varies greatly from person to person. We have all developed a very particular way in which we shop, consume, and budget our dollars when it comes to food. At Gorman Farms, we have tracked each distribution for several years. The CSA food value has been several hundred dollars more than the price of the purchased share for that particular season. It is up to you how much you take and how you interact with it. For those that love preserving foods via canning, freezing, and drying, this value is drastically enhanced. People who fully embrace the CSA do not compare their membership experience to grocery store pricing. Price comparison is important. However, participating in our CSA is not just about doing a cost analysis of each vegetable you receive and then comparing it to grocery store prices. Why is CSA so popular and important? With only 2% of Americans producing food for the other 98%, people are increasingly separated from the source of their food. Community Supported Agriculture is a response to this issue. It is a model that emphasizes locally grown, which promotes the local economy, and a safe food system. Participation in CSA leads to a deeper understanding of our interdependence on one another and the land. The farm supplies nutritious and delicious, chemical-free food, as well as an opportunity for a community to come together. Everyone can reconnect with the seasons of local food, and help preserve open space for working farms. Can I come visit the farm? Only during Pick-Your-Own Strawberry Season, or if you are a CSA member, on your selected pick up day. Is your farm open to the general public? Only during Pick-Your-Own Strawberry Season and any other scheduled seasonal events. Click for Pick Your Own Strawberries details. Where can I buy your farm's fresh produce? Send us an email from our Contact Us page. Do you offer tours of your farm? Not currently. We hope to in the future. If you are a school or college doing research, please send us an email. We will do our best to accommodate you but there are no guarantees. How do I pay for my CSA membership? By credit card via our website. Please visit the signup page. At the end of the signup process there will be a secure checkout page. Can I choose my pickup day? Yes, you will have the option to choose during the signup process. We only have so many spots per day and your first choice may be taken. If this happens please choose another day. Can I have someone else pick up my share, if I’m not available? Of course and you should! Anyone can pick up on your behalf. They need to sign off under your name when picking up. What if I have an emergency or an unusual circumstance, and can’t make my pickup? No problem, we understand the unexpected and want you to get your food! You may send anyone on your behalf to pickup. Please have them sign in with your name at the pickup. Or, please come on a different scheduled CSA pickup day. Pickup days are Wednesday, Thursday, and Friday from 2:00 – 7:00 pm. There is no need to notify us or ask permission. Please stick to your day on a regular basis. This privilege is for those rare occasions, family plans, emergencies, or times when it all didn’t work out, the way you thought it would! We understand that may happen a few times throughout the season. Or, if your schedule changes and you need to change your pickup day for the remainder of the season, send us an email at csa@gormanfarmscsa.com. We will be happy to make this change for you. This is not to be taken advantage of; you need to be responsible for your food each week. Each week, all uncollected produce will be donated to the Maryland Food Bank or local food pantries and donated to someone in need. It will not be wasted. Keep in mind: we want you to get your produce. We are flexible with emergency situations. Is there still a pick up in rainy or inclement weather? Yes, CSA pick up days are rain or shine. Are there pickups on snowy days for the Early Winter CSA Program? In the event we feel it is unsafe or the weather affects our ability to distribute your produce, we will notify you via email immediately. Will pick up times be available after work hours? Can I split a share with my friends, or can we join in together? Yes. Please follow the instructions, while signing up, as it prompts you for shared members. Anyone can come to pick up. You are responsible for divisions within your group. No special arrangements will be made on pickups for divided shares. You may provide contact email information to all parties in your group so that everyone can receive the updates, reminders, and newsletters from us. * Note: Splitting between more than two groups is not recommended on a full share. Splitting a medium share is not recommended. Please submit only one payment in full and work out your payment arrangements outside of our sign up process. A good way, to split a share is to alternate your pickups with your partner. Can I add the other names of individuals in my CSA share group? You will have an easy option to do so in the sign up process. If additional emails are needed, please email us and we will add them for you. Do you offer value added products like meat, cheese, eggs, bread, tree fruit, berries and more? We are a vegetable heavy CSA with some fruits like strawberries, melons and tomatoes if you consider these a fruit. Do I need to take everything that is offered? I don’t like wasting food. No, only take what works for you. Look at your selections list on the share board and choose within this list. Click to learn about all unclaimed produce. What do you mean by partnering farms in the membership agreement? Farming is not a constant and variables outside of our control can result in crop loss. We reserve the right to still satisfy our CSA members by supplementing the share with our partnering farm, One Straw Farm, a certified organic produce farm in Baltimore County. What if I don't use the internet or email all the time? We only communicate with our members via email. It is important that you check your email regularly so as not to miss out on any pertinent information. Contacts will be in the form of reminders, updates, specials, and newsletters. Any missed emails, on your part, should not result in you missing out on your purchase. Yet you may miss some extra benefits. We respect your privacy and will not spam you with offerings outside of the immediate CSA season for which you participate. How do I update my contact and/or email information with you? Whether you are a new or returning member, you will have the option to update your contact information during the signup process. If you have already signed up and need to make a change, send us an email to csa@gormanfarmscsa.com and let us know the change. We will confirm the update with you. Where do we pick up our CSA share? 10151 Gorman Rd., Laurel, MD. 20723. When do we pick up our CSA share? Pickup days are Wednesday, Thursday, and Friday from 2:00pm – 7:00pm. You will select your day, during the signup process. As a member of Gorman Farms CSA, you will receive an assortment of vegetables for 20 weeks, (3 weeks of strawberry picking if you add the strawberry boost and 7 additional weeks if you add the Early Winter CSA) starting around the first week in June. You will come each week to the farm on your selected day for your pickup. We will have everything set up like a farmer’s market with share boards posted on the wall and labels at each display guiding you through your selections. The pickup process is interactive but also set up for those of you with time constraints. You can interact at your own discretion or just get your produce and go. Pick up days are Wednesday, Thursday or Friday from 2:00pm – 7:00pm. at the farm. What products can I expect? We are a vegetable farm only. We do not grow tree fruit. Your shares will be vegetable heavy. This should be your general interest. See our CSA Boosters page for details on other foods. We provide upwards of 100 varieties of vegetables each year, so you can expect to see many of your favorites, along with some new items. The spring and fall offer a variety of greens and roots, while the summer sees more meaty crops, like tomatoes, peppers, squash, watermelons, cantaloupes, cucumbers, etc. There are many variables out of our control and crop failures do occur. Therefore, we can’t guarantee you any specific vegetables, yet we can guarantee you a good value in your share each week. We aim high, but every year is different in terms of weather, bugs, and disease. We always have the variables of unpredictable events in our fields. Being a CSA member means accepting these risks along side the farmer. What popular items will I NOT see in my CSA share? Bread, cheese, dairy, and tree grown fruit. We all consume produce at different rates. For some people, a CSA share is more than enough food. Others will choose to supplement their weekly consumption with other produce. It is impossible to tell anyone how much of a share their household needs. We can only recommend from our extensive experience and give you the most honest answers possible. How much food is in a share? What is the difference between Full Share & Medium Share? A Full Share commonly accommodates a strong vegetable consuming and/or vegetarian family of two. Full Share usually accommodates a 2+ member family that is a light vegetable, consuming family. Full Share often consists of approximately 8 – 12 items per week. A Medium Share commonly feeds 1 or 2 people and is approximately 5 – 10 items each week. During the peak of the growing season, there will be more. Although this is not a definite rule, this is generally true. Depending on the success of each crop, you may get a surplus of any one item or smaller quantities of others. This is all seasonal dependent. A Medium share is a bit larger than half of a full share. It is about 75% of a full share. You’ll notice that in the price as well as the share. Full Share costs more, therefore they get more benefits. We end up giving the Full Share more in whatever way is available. Full Share will usually get the benefit of the doubt whenever harvest numbers come in less than anticipated, and there is not enough to suffice for both share types. In general, Full Share will also receive additional items per week. On some occasions, this may equal more variety options. Many variety trials take place on the farm, and sometimes harvest yields from trials will not come in sufficiently for both Full and Medium Share. A Medium Share is not short-changed by any degree. Full share may have a touch more choices or options at certain pickups. Our program and planting plan is very detailed and calibrated to suit all members. The farm does not discriminate on any member type or pickup day. We always distribute what we have available that day and week. We also keep detailed records on every member’s share and distribution day to balance everyone out. It is best to stick to your pick day each week. Plants are finicky and Mother Nature may only give us half of the harvest on one day and the other half 6 days later. An item is an average usable and/or commonly purchasable portion of any one crop. We do our best to offer each crop as an item in the same way we are all accustom to purchasing from our favorite store or farmer’s market. Occasionally the amount of the crop will vary due to Mother Nature and elements out of our control. I.e. a head of lettuce, a bag of spinach, a bundle of carrots, anywhere from 2-8 lbs of tomatoes, a bundle of beets, a bundle of kale, 2-3 lbs zucchinis, 1 lb of green beans, 2 eggplants, one cabbage, a head of broccoli, one watermelon, a bundle of basil, etc. Many other CSAs buy in from multiple sources and redistribute, we do not. We grow 30 – 40 different types of crops per year. This yields over 100 varieties of produce. Gorman Farms focuses on these crops selected for our CSA growing season. Timing and punctuality is key. You are buying the freshest produce. Produce comes right from our fields and the fields of our partnering farms direct to the CSA display. Much of your produce will be harvested, the day you pick it up. You will notice this in the flavor and quality. Our CSA pickups and distributions are maintained and staffed by a member of our Farm Crew. Staff is present to keep track of quality control. A staffed CSA distribution is different than many CSAs, as we can maintain quality control on a much higher level than others. We do our best to make sure, whether or not you are the first person or last person picking up for that day, that you have the same options and quality available. (This is hard for many CSAs to beat). We offer flexibility in pickups. Schedules change, you may get stuck in traffic or work longer than expected, etc. Life happens, we know that, and we want you to receive your food. You may pick up on any other CSA pick up day, when needed. You do not need permission, confirmation etc. to do so. We have convenient long pickup windows – three days per week with 5 hour windows from 2:00pm – 7:00pm. All of our CSA pickups are located on our farm.